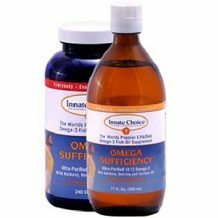 The following is our review of Innate Choice Omega Sufficiency. 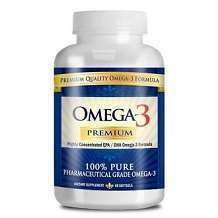 This product claims to be the purest, most natural fish oil available with natural EPA:DHA ratios. Omega-3 fatty acids have been scientifically shown to be crucial to health and extremely important in the prevention of illnesses such as heart disease, arthritis, ADD, depression, stroke, cancer, diabetes, high blood pressure, obesity, osteoporosis, Crohn’s disease, ulcerative colitis, eczema, learning and cognitive development problems, and Alzheimer’s. Continue reading for our full review. The ingredients in this product are taken from cold water anchovies and sardines. The extraction process keeps the fish oil in its most natural form. Omega-3 fatty acids have also been shown to be beneficial in preventing illnesses such as heart disease, arthritis, ADD, depression, stroke, cancer, diabetes, high blood pressure, obesity, osteoporosis, Crohn’s disease, ulcerative colitis, eczema, learning and cognitive development problems, and Alzheimer’s. The dosage instructions for this product depend on your weight. 1/2 teaspoon or 2 capsules per 40 lbs/18 kgs of body weight. Fore example adults weighing 160 pounds should take 2 teaspoons or 8 capsules a day. A 200 pound adult should take 2-1/2 teaspoons or 10 capsules a day. A 40 pound child should take 1/2 teaspoon or 2 capsules a day. An 80 pound child should take 1 teaspoon or 4 capsules a day. Liquid oil must be refrigerated after opening. Shake well before each use. Capsules do not need to be refrigerated. Store away from direct sunlight. There were no possible side effects mentioned on the manufacturer’s website. Please consult with your doctor before adding this supplement to your diet as well as any other supplement you use. Innate Choice Omega Sufficiency can’t be purchased directly from the manufacturer unless you have an account. We were able to find the oil sold on amazon for $59.96 which contains 100 servings. It will most likely last an adult 1-2 months depending on their weight. A bottle of 240 capsules is currently being sold on amazon for $119.93. Which will last also about 1-2 months depending on your weight. Obviously the oil is cheaper than the capsules, but in general this product is expensive. The manufacturer stands behind their product 100%. If you are not happy with your product, they will refund any unopened products if you return them within 30 days. You will first need to call them so they can arrange acceptance at their warehouse. You will not be refunded for shipping costs. There is a restocking fee that will be at least $5. This is a pretty fair guarantee, but it would be even stronger if they allowed you to return opened products. There are a couple of positive things about Innate Choice Omega Sufficiency. The oil had mostly positive customer reviews. Customers said this product had no smell and a decent taste. It even helped 1 customer get rid of a rash they had on their leg. There were a couple of negatives about this product as well. It is pretty expensive compared to similar products on the market. Even though it is backed by a guarantee, it doesn’t allow you to return used products which doesn’t allow you, the customer, to have a risk-free buying experience. We feel you can find a more affordable product elsewhere.